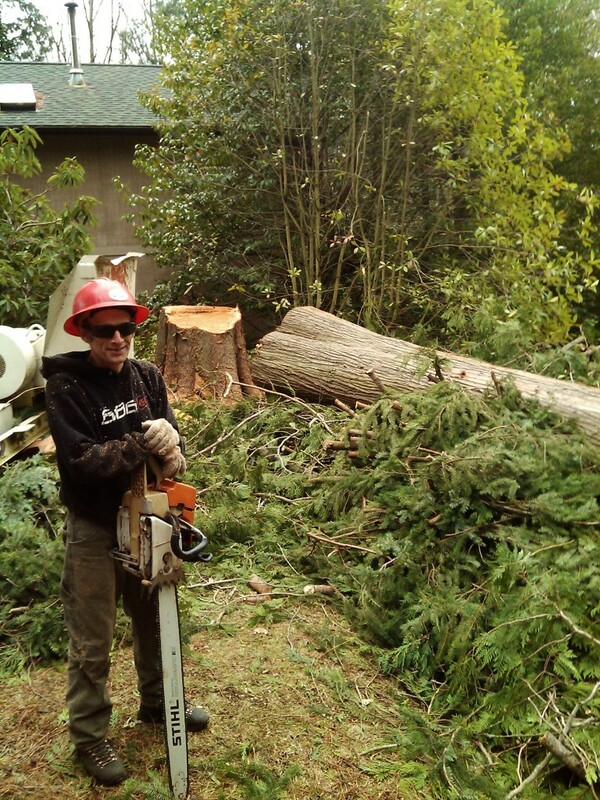 Wind and Tree Service in Bellingham WA | DigLynden Tree Service Got a referral call yesterday about 4:30 p.m. from a home owner who was concerned about a tipping douglas-fir. The heavy rain followed by strong winds apparently caused the tree to up-root and fall over a couple feet. You could see where the root ball was coming up through the ground. Wasn’t enough time to do much before dark so I re-arranged my schedule and said I’d be there in the morning. By the time I was leaving Lynden for the job, the wind was kicking. Gust up to 50 mph, and a nice steady rain. At least it was warm though. Stopped at the 76 in Lynden for diesel for the chipper and headed for Yew St.
After looking at the tree, I thought it would be a good idea to shore it up. I did not want to climb it, looked like the extra weight could cause it to go over. Carry a 50′ one inch rope for such things as this. Climbed around 30′ and tied off, came down and climbed up another douglas fir 20 feet away and secured the rope. At least this way if the fir went over it would swing around and miss the road. San Jaun Blvd is a pretty busy side road. Better that the tree not smash into it. Let the wind blow, and it did. Monkeyed up the tree next to the one I was removing. Another fir and close enough that I could do the cutting while in it. Leaned over and took off branches as I ascended up towards the top of the dangerous tree. Once I got within 20 feet of the top I yelled for Steve to send up a lowering rope. Put it through the tree I was on and tied it to the dangerous fir. At this point the wind is whipping the trees back and forth two to three feet. Was concerned that the swirling nature of the wind would cause the top to come back in my direction, so I practiced my escape maneuver a couple times before making the cuts. Put the face cut in, then brought the back cut up close enough that the wind would break it over. This gave me time to jump into my safety position has the top came over. The wind calmed, I waited, and then blow she did and the top came floating over, hanging on the lowering rope. Steve gave it slack and slowly lowered the 20 foot top safely to the ground. The fun wasn’t over. The trees are moving hard and jolting back and forth. I leaned over and cut in a few inches then came around and cut from the back toward the hinge, leaving just enough that I could break it off myself and control where it landed. The pieces were around three feet. Slam right into the drop zone. Piece by piece until I couldn’t reach the cuts anymore from the tree I was tied into. I felt, pretty good, about putting my weight onto the removal fir and it not tipping over. So after I set up my repelling line, I swung over the fir and held on free hand. Didn’t want to secure myself to the tipping tree in-case it fell over. The angles and the force of the wind held me right in place to take enough pieces off that Steve could fall it. Left a pull rope in the top and swung 10 feet back to the other fir. Came on down and got out of the way so Steve could finish it up. That was probably in the top 5 for windy tree service work. Don’t recommend it and usually won’t do it but for combat pay, I’ll get’er done! This entry was posted in Job of the Day and tagged bellingham, service, tree, wa. Bookmark the permalink.